The Difference Between Hot…and Not. It’s always a little sad when the holidays are over. The gifts (oh look! 3-1 Penguins!) are all unwrapped. The papers and bows (or HBO’s) are done and in the bin. Now it’s just January, meaning it’s time to go back to work. That work starts tonight at Verizon when we meet the Lightning, who are making a surprising challenge in Southeast Division. OK, surprising may not be the right word. 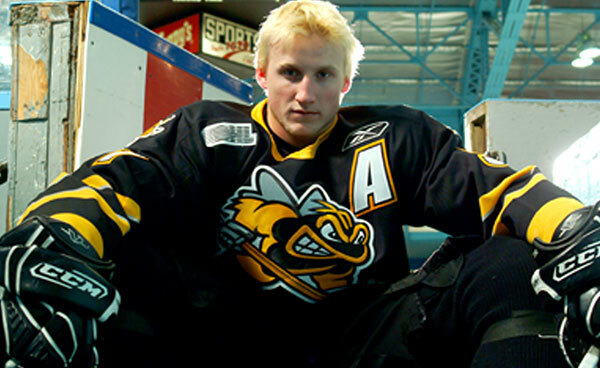 Not at least with the hot streak Steve Stamkos has been on. Umm…did we say hot? The 20-year-old Ontarian flew south to Tampa after several years playing center for the Sarnia Sting. This year he’s second in the NHL with 31 goals and has found the twine in five of his last six. 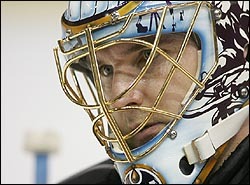 More hotness…or notness…after the jump.The Lightning also just acquired Dwayne Roloson as net-minder. No spring chicken, the journeyman goalie served time playing for the Wild, Oilers, Blues, and most recently the Islanders…and is expected to get the start tonight. It’s usually next to impossible to really see what a goalie looks like: way too much blocking the views for our tastes. But with those pucks being hammered into the nets, we’re glad they’re protected, and this shot gives a little taste of what’s under the padding. And then there’s GM Steve Yzerman. Sure, he’s in the front office now…but as this boy in Red can tell you, there was a time when he practically walked on (frozen) water in Hockeytown. 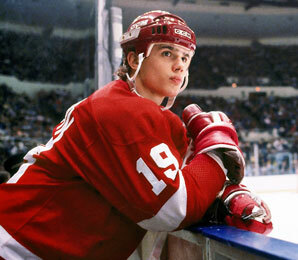 Two decades with the Wings. It was a good time to be in Detroit. Mike Vogel’s beefcake-free, Bolts preview is here. 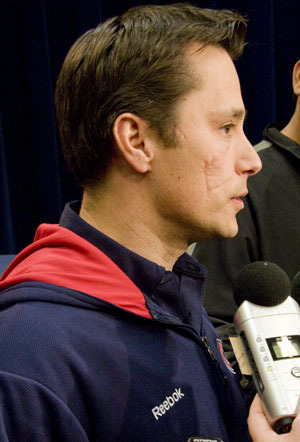 This entry was posted in Uncategorized, Washington Capitals and tagged Dwayne Roloson, Guy Boucher, hockey scars, Steve Stamkos, Steve Yzerman, Tampa Bay Lightning. Bookmark the permalink.